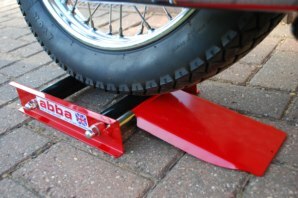 The abba Wheel Spin is designed to make wheel cleaning and chain lubrication simple. The main rollers each have two quality integral shielded bearings for easy spinning. All four bearings are pressed into a CNC machined insert, this allows the bearing to sit perfectly aligned and does not allow the roller to spin on the bearing itself (a very common problem on cheaper made versions). The long shallow angled ramp allows the operator to roll the bike up onto the wheel spin with ease on any floor. This product can be used with all motorcycle wheels front and rear. Simply wheel your bike up onto the rollers, lean your bike on the side stand and spin away! Not to be compared with cheap copies available. 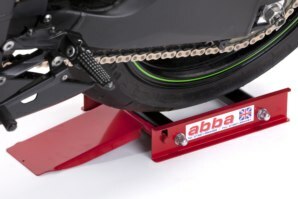 Like all abba products this is made to the highest quality, for ease of use and built to last! Four integral bearings allow very easy wheel spinning. Shallow angle ramp allows an operator to effortlessly roll the bike up on to the wheel spin by themselves. Foldable ramp makes the wheel spin extremely compact when not in use. Comes 100% assembled ready to use out the box. Viewing records 1 to 1 of 1. I ordered an Abba Wheel Spin back in June of this year and thought you'd like to know that I am very happy with my purchase. It does what it says on the tin! Simple to use and small enough not to take up too much room in the mother-in-law's garage. I tried to be a cheap skate and bought a similarly named product previous to dealing with yourselves only to find it was cheaply made and could not deal with the weight of my Bonny (featured in MCN, Classic Bike and TWO, oh yes). It was too small and awkward to set-up. About as useful as the bottom half of a mermaid! I regularly use the Abba Wheel Spin to clean my lovely alloy wheels and clean/adjust the chain. This necessary but often tedious chore is now quicker, cleaner and easier allowing this bad boy to ride his bike sooner. Well done Abba. Is the Wheel Spin capable of spinning my sizes wheels? The Wheel Spin is capable of spinning any size wheel up to a 200 section rear wheel. Will it matter if the wheel spin gets wet when cleaning my wheels? The bearings in the rollers are fully shielded and the product is fully powder coated to avoid corrosion so light contact with water will not cause a problem. A squirt of penetrating fluid or light oil on the side of the bearings is helpful from time to time if coming into contact with water frequently. Does the abba Wheel Spin come with a guarantee? Got a Question about the abba Wheel Spin? If you would like to ask us a question about the abba Wheel Spin, simply fill in the form below and we will contact you within two working days. Want to tell a friend about the abba Wheel Spin? Alternatively fill in the form below and we will send an email on your behalf to your friend, with a link to this page all about the abba Wheel Spin.